Whenever we have potlucks, there are always certain recipes that friends are required to bring. I’m always asked to bring my cheese ball. Darlene is always asked to bring Cornbread Salad. It’s been a while since we’ve done a potluck so I decided to make Darlene’s Cornbread Salad for our Sunday family lunch. It got rave reviews! Once upon a time, Darlene was my amazing administrative assistant. The first time she brought her Cornbread Salad to share at work, I thought, no way am I eating something called cornbread salad. But after just one bite, I was a believer. I never imagined the ingredients in this recipe would go so well together. If you’ve never had cornbread salad, you’re definitely in for a treat. This recipe begins with two boxes of Jiffy cornbread mix. When it comes to cornbread, I’m a snob. I usually make it from scratch. Trust me on this one, you need to use the Jiffy mix for this recipe. Bake the cornbread mix according to the directions on the box. Cool and crumble. Combine chopped tomatoes, chopped peppers, pickles, onions, and crumbled bacon. In a separate bowl, combine mayonnaise and pickle juice. I’m also a mayonnaise snob and I always use Duke’s. Is there any other kind? Sometimes, when my daughter is doing Whole 30, I make homemade mayonnaise. It’s delicious too! In a glass bowl or trifle dish, add a layer of crumbled cornbread. Top with a layer of the tomato mix. Add a thin layer of mayonnaise mix. Continue layering, ending with the mayonnaise mix. Refrigerate until ready to serve. This salad is perfect any time of the year, but I especially like to serve it in the spring and summer because it’s a chilled salad. It was a huge hit at Sunday lunch this past week. I think I’ll make it again real soon. Trust me. It’s a keeper. Bake cornbread according to package directions. Let cool and crumble. In a bowl, combine tomatoes, peppers, pickles, onions and bacon. In a separate bowl, combine the mayonnaise and pickle juice. 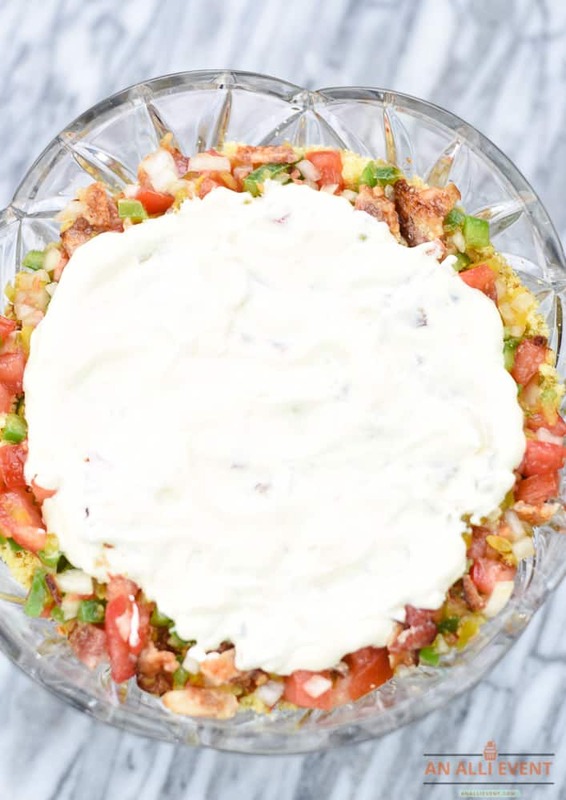 In a glass bowl, layer the cornbread, tomato mix, and mayonnaise mix. Repeat, ending with mayonnaise mix. Refrigerate until ready to serve. Ahhh, that sounds amazing! I love a salad, especially now spring is coming! Hah! love that you’re a cornbread snob! I’m not and will eat gobs of any kind of cornbread. 🙂 I do love Jiffy though… This sounds so unique and looks really good too. Definitely something I want to give a shot to, especially since we’re always trying out new salads. I love anything that starts with Jiffy. I am going to give this salad a try. I think it would be a big hit in my neighborhood. Cornbread salad? I’ve never had anything like this before. I must try this! I’m pretty sure I’d love it. I have never heard of a cornbread salad but this looks delicious. I am pretty sure my family would love this so I may just make this as a side for this evening’s meal. I have never heard of this! Where has this been all my life? I love the originality, and it looks so delicious and easy to make. This looks like such an interesting cold appetizer or side dish! It looks perfect for an outdoor barbecue, like a more exciting version of the same old pasta and potato salads. Now this sounds like a really interesting salad! I haven’t had anything like it before myself, definitely something I need to try though yum! Sarah Bailey recently posted…And the Winner is SALLY! I have never heard of corn bread salad. This looks and sounds amazing. Interesting! I don’t think I’ve ever heard of, or eaten cornbread salad. I do love cornbread though. How have I not heard of cornbread salad before?? This looks so good!! I am sure that this cornbread salad will be a new favorite in my family, too! Looks fabulous! I’ve never had anything like this before. It looks really yummy, it would be perfect for my family dinners. Looking at this makes my mouth water already. I just love the overall mix of everything. Pretty healthy and yummy. I have never had a cornbread salad before, it is something new to me. That really look so good! That looks good! Only had cornbread before, but never had a cornbread salad. Love me a good salad! I’ve grown up with cornbread and making cornbread, but I have never heard of cornbread salad. It sounds like a great thing to take to a potluck! This wonderful idea, I have eaten corn bread as sides with salad . Never tried corn bread salad. I am going to give it a try. 1/4 cup pickle juice – do you use the sweet pickle juice or dill?